Everybody loves heist movies or capers. Especially if you enjoy Home Cinema treat on a nice Sunday afternoon. Who can say 'no' to a great adrenaline-pumping heist packed with action, surprises and twists? But, there are so many claims to be an exciting heist movie. Which one to pick? One’s favorite movie can be very boring for another. Or the vice versa. So how to make a list of best heist movies for everybody? So let’s create a one! Only a few clicks per movie all you have to do. Since I am building my blog whenever I have free time, and adding each movie takes time, each time you come back to my blog, you will see more and more movies with richer context. At the moment, there are 67 robbery movies in the blog, while many others, including the latest heist movies, are waiting to be added. So make sure that you note down my blog address or click the button to be a 'follower' and come back. And please don't hesitate to vote for the polls and share your opinions to encourage my work. 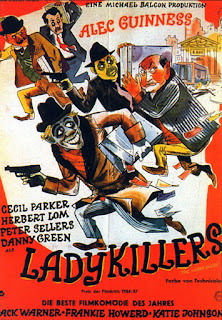 Here is the original The Ladykillers that Coen Brothers made a remake in 2004, also available in the blog. 1955 British production with big stars like Alec Guinness and Peter Sellers offers a great caper movie, a classic in its genre and promises lots of laughter. I enjoyed this movie very much and although I am fan of both Coen Brothers and Tom Hanks, I like this one much better than its 2004 remake. The lead actress, Katie Johnson did a great job in my opinion and I cannot think that I would enjoy this movie without her as much. The interesting thing is she was director Mackendrick`s original choice for the role, but the producers found her a little too frail for the job, so they cast a younger actress who sadly passed away before the filming began. Katie Johnson was 77 years old back then, did only one more movie after this one and passed away only 2 years later after The Ladykillers was released. The Ladykillers was nominated for Best Writing & Original Screenplay for Academy Awards. Katie Johnson won Best British Actress award and William Rose won Best British Screenplay award in BAFTA, where the movie was nominated for Best British Film and Best Film from any Source categories. If you like capers, or comedies, I believe you have to try this one if you haven`t already done so. To see the whole blog, click here. then this is your movie. Important Reminder: Below trailer might contain important spoilers. One of the most important differences separates my blog from other robbery / heist movies blogs, my blog contains some of the latest movies while almost none of other blogs list them yet. Another big difference is it lists from the first ever made heist movie to classical era up to very new heist movies just out in videomarkets. I don't list all the movies under one single list. There are 3 main listings; one for real and pure heist movies, the other one is not necessarily heist movies but considered as heist movies for many people so can be indirectly categorized as heist and lastly caper movies, meaning comedy heists. 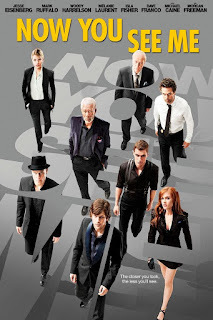 So you won't see a Bonnie and Clyde is being compared with an Ocean's Eleven in my blog. Lastly, my listings don't focus on Hollywood Cinema only, but it offers a huge variety of heist movies from World Cinema. Today I list at around 60 movies in my blog, but it won't be limited even with 100.